bl.uk > Online Gallery Home	> Online exhibitions	> Asia, Pacific and Africa Collections	> Bhisti (water carrier). 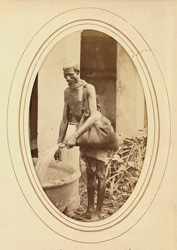 Full-length carte-de-visite portrait of a water carrier, one of a series of portrait studies of ethnic types and occupations taken by Bourne and Shepherd in the early 1870s. A bhisti was a water carrier, carrying water in a mussock or goat-skin, slung on his back.